In some ways, the year of vastly overestimating myself is going great! I have three jobs now not two, and I'm occasionally going outside and doing things that aren't work. 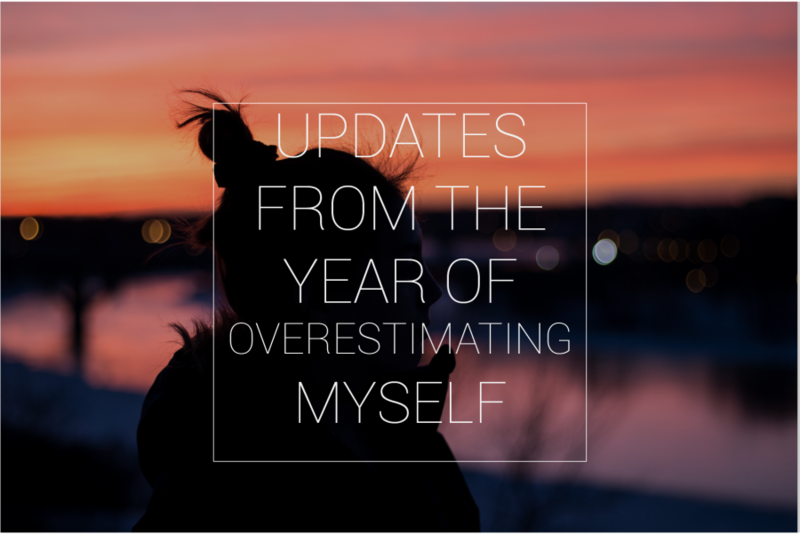 I'm rewriting still, and trying not to doubt myself too much. I'm considering posting a little fun thing I made on Wattpad to remember what it is to have fun. I know in many other ways 2017 is not gong great for everyone but hopefully, like me, while entrenched in resistance you're finding the joy in the world too. I think it's improtant not to lose that. Anyway, here's an extract from the fun thing I'm considering posting on wattpad! Are you on wattpad? I'm miahayson over there. I'd love to be pals!! The patio is sickly sweet with the smell of barbecue, and my Dad still hunched over the embers prodding at was probably once meant to resemble dinner, as I walk outside. A light rain has settled over the small country village of Longfarn again, just as my father decides to celebrate summer in the rising dark. "Have an olive," Aunt Ruby says in her usual melodic tone when I find a dry patch of bench to perch on. She kicks off her sandals, rubbing her toes into the fast dampening patio slabs. Ruby always says you can tell a lot about the world from the water in it. Her bracelets jingle against the bowl as she shakes it under my nose. I raise an eyebrow at her (as a general rule I try to stray away from eating anything with stones in it) but she just gives back her blankest expression. Brown eyebrows neither raised nor lowered, her lips are set in a straight line. She taught me that expression. It's hard to have it used against you. "Don't you dare take a thing that woman is offering," Dad's voice is slightly muffled by the barbecue hood but there's no missing the panicked inflection. "You'll ruin your appetite for dinner, and then where will we be?" Ruby probably told him it'd rain and he didn't listen. My father hates anything that defies his logic, and often that includes meteorology. I can't count the number of times I've caught him muttering at the TV about how there's no such thing as fifty percent chance of rain because a fifty percent chance is just chance. My Dad's fear of the illogical is largely why we haven't told him about the small fact of the very large paranormal world yet — neither one of us wants to destroy his finely tuned view of things. Plus, there's that and then there's the whole letting his only child run around with vampires and whatnot thing. Ruby just clucked her tongue and shook her bracelets at me last time I pointed this out but I know she worries about it too. Problem is, I'm in too deep now to stop working for her. Or, at least, I hope I am. My one very brief stint with the only takeaway service in the area , cycling curries to our neighbours to earn back the shortfall Gorman left me with, was a glimpse into a world I never want to be a part of. Bring me heartbroken gremlins, insane werewolves, and kidnapped tooth fairies any day of the week. "Did your friend have a job for you?" Ruby says in hushed tones when my Dad scuttles inside though the open patio doors 'to get more fuel' and I turn to watch the patio lights cast shadows on her face. In the distance, far over her shoulder, shadows lurk in the night. I push them from my mind. Both Ruby and I know 'getting more fuel' is dad-speak for rifling through his garage drawers until he finds lighter fluid but it looks like we're firmly entrenched in Barbecue mode tonight. There's no point resisting the process. "You heard him?" I'm always surprised that Ruby can tell when somebody's visited me. With some clients they're easier to hear than others. Werewolf claws sound like branches scratching on a window pane. Gremlins pad around a room with the weight of a large cat, our floorboards creaking occasionally. "I smelled him," Ruby says, just as Dad returns brandishing a bag of coals. As if he's going to use those. Both of us clock the lighter fuel can in his back trouser pocket but I nod and smile anyway. I even give him one of my rarer thumbs-up gestures.